Wear again? if I line the inside with felt or fabric and maybe add to or fix the brim. I am a member of the Airship Passepartout Steampunk group here in Ohio. Recently, there was a hat and mask build day to prepare for the upcoming Voodoo Carnival. Everyone who could, brought some crafting supplies to share and we all got to play at creating and embellishing a hat or mask or whatever project they were currently working on at the time. I was really looking forward to decorating a mask, but could not think of how I wanted it to look. I am a Pinterest addict. There is so many inspiring ideas and links for how-to make a large majority of those ideas. 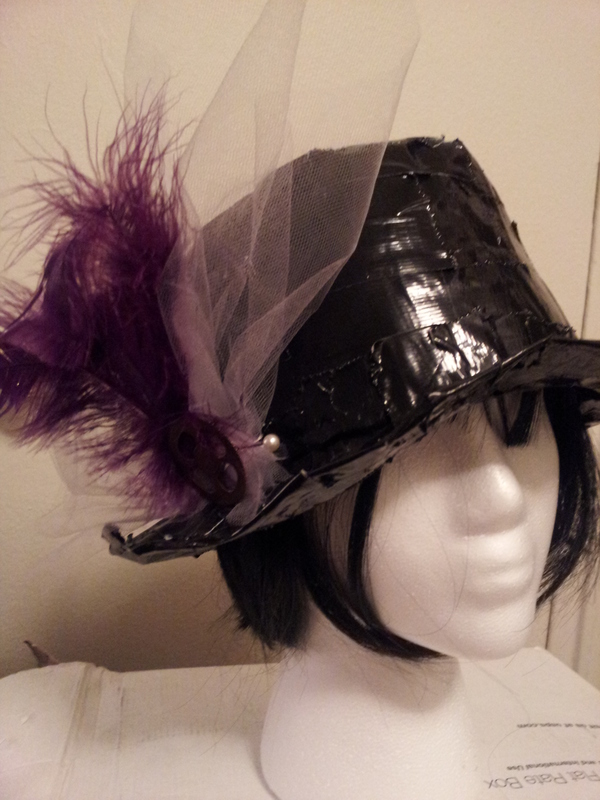 While preparing for the build day, I found that I had a link to a tutorial on how to make a top hat out of duct tape. (http://www.cutoutandkeep.net/projects/diy-duct-tape-steampunk-top-hat) I thought that was a brilliant idea and knew that there would be a hat that I could use as my template, as well as plenty of duct tape to use to make the hat. Unfortunately, I did not think to confirm that I was following the instructions as I was making the hat, so there are some problems with the hat as it currently is. One of them being the sticky duct tape that pulls my hair in the inside of the hat. If I had followed the directions, there would be more layers of tape and the tape would be sealed in itself. Or, if I had done more research I could have used some of the tips on using duct tape found in this Instructable here (http://www.instructables.com/id/Duct-Tape-Top-Hat/). As you may be able to tell from the pictures, I have not painted the hat, nor have I added the hot glue rivets and other accents. I figure that I can do that after I figure out how to make a top hat that I would be happy to wear comfortably. Since there was so many craft supplies to choose from, I could not just stop at a mostly finished hat. There was a Steampunk crafting book available for inspirations and I really liked the idea of a cockade added to my hat. So, I made something that looks nothing like a cockade. I gathered some tulle, hot glued some feathers on top, and glued a gear on top. Then, I used a corsage pin to attach it to the hat temporarily. Sorry for the poor picture quality. I hope you can see enough that you can get the idea of what it looks like. My apartment interior is very dark and cave-like, no matter how many lights we use.